Vanilla, Chocolate and Strawberry ice creams between a split Banana. Layered with Chocolate, Marshmallow, and Strawberry toppings. Finished with Whipped Cream, Pecans, and Cherries. Banana Fudge ice cream topped with Peanut Butter, Whipped Cream and a Cherry. Coconut Almond Chip ice cream covered in Hot Fudge, topped with Whipped Cream, Pecans, and a Cherry. Vanilla ice cream atop of warm Brownie. Topped with Whipped Cream, Pecans, and a Cherry. A scoop of Vanilla and Chocolate Chip ice creams covered in Chocolate Syrup and Spanish Peanuts for that wonderful combination of chocolate and salt. Choose your favorite ice cream & topping. 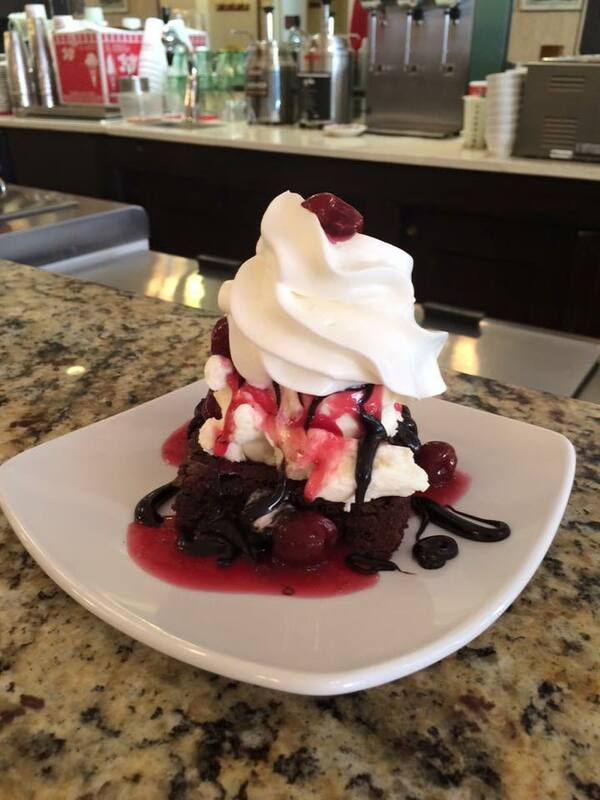 We'll complete your masterpiece with whipped cream, nuts, and a cherry. Toppings: Chocolate, strawberry, pineapple, raspberry, peanut butter, marshmallow, butterscotch, hot fudge or hot caramel.